History buffs can only name a handful of personalities from the Civil War that seem present at many important events. One man that finds himself involved in widespread actions is Confederate engineer Martin Luther Smith. Smith played a crucial role in both the western and eastern theaters. A native New Yorker, Smith graduated West Point in 1842, before military duties took him south. While stationed in Florida, Smith married a native Georgian. During the Mexican War, Smith received a brevet promotion for his services in helping Winfield Scott as an engineer. At the time of the Secession crisis, Smith chose to follow his adopted home and cast his fortunes with the Confederacy. Though Smith’s background was as an engineer, he found himself serving in the infantry as a brigade commander in New Orleans. However, Smith managed to find the time to assist in planning out the defenses of the city, and there he began to show his prowess for identifying and overseeing construction of defensive works. Smith was soon transferred to the Confederate Engineer Corps as a brigadier general. He oversaw the defensive works around the vital city of Vicksburg while serving as garrison commander of the city and helped repulse Union forces at the Battle of Chickasaw Bayou. During the final Vicksburg campaign, Smith led an infantry division in Lt. Gen. John Pemberton’s army. With the surrender of the city, Smith’s parole effectively took him out of the war for seven months. After Smith was exchanged in February 1864, he reported to Richmond and became the chief engineer to the Army of Northern Virginia. Lee required good engineers to assist in thwarting Lt. Gen. Ulysses S. Grant’s summer campaign. Smith proved his skills as an engineer on May 6, 1864 at the Wilderness. As Lt. Gen. James Longstreet’s corps counterattack began to stall in the morning, Smith scouted out a way around the Union left. Longstreet considered Smith “a splendid tactician as well as skillful engineer and gallant withal.” Shortly, Smith returned to Lee and Longstreet and informed them of an unfinished railroad cut that could lead an attacking force around the Union left. With his help, Longstreet was able to send four brigades along the route and roll up the Union left. Smith continued to assist Lee and also played a pivotal role in developing many of the lines around Spotsylvania, including the “Mule Shoe” salient. Arguably, Smith’s finest performance may have been on the banks of the North Anna River on May 23, 1864. As Lee improperly guessed the Union army’s intentions, Grant was able to cross three corps south of the North Anna. Easily flanked in his current position, Lee called a staff meeting at Hanover Junction and discussed options. One was to pull back to the South Anna River, but this gave up the very important railroad intersection at Hanover Junction. As his second option, Lee considered using the Virginia Central Railroad as a defensive embankment, but this opened his left flank for an attack. His final option involved a possible shift eastward to the Totopotomoy or Pumunkey rivers, Grant’s expected next target. This gave up the rail junction though and drew the fighting closer to Richmond. Another option was available, and Smith proposed turning a bad situation into a great tactical opportunity. Smith suggested creating a new defensive line that formed an inverted “V,” using strong geography to the Confederate’s advantage. By using internal lines, Lee could reinforce either side of the “V” easily. The Confederate position divided the two wings of the Union army and placed the North Anna river between them and reinforcements from the other wing. Lee’s army could easily leave a small force behind to hold one line while the bulk of his force crushed one of the Union wings that crossed the river. It was an innovative idea and one that the commanding general whole heartedly agreed to. By the morning of May 24, the Confederate lines were redrawn, and Grant walked into Lee’s trap. Unfortunately for the Confederates, Lee lay prone in his tent due to sickness, and the attack never took place. Grant eventually realized his folly and withdrew to the north bank of the North Anna. 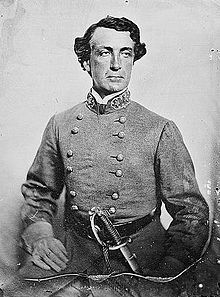 Smith remained the Army of Northern Virginia until July, when he was transferred to the Army of the Tennessee where he served Confederate Lt. Gen. John Bell Hood in the same capacity he had with Lee. After the reckless Tennessee campaign, Smith was again transferred to Mobile, Alamaba as a Departmental Engineer. He oversaw the improvement of the defenses of Mobile, though the port was virtually closed in the summer of 1864 by the capture of the Mobile Bay forts by Adm. David Farragut. When the city fell in April 1865, Smith returned home and surrendered in May. Smith passed away in 1866 in Rome, Georgia at a young age of 46. The New York Times reported that he was “attacked by an inflammation of the bowels” and was buried in Athens, Georgia. Martin L. Smith remains a mystery for historians. He was a man who was intimately involved in so many important actions of the Civil War, yet he is not the focus of any biography or major work. Sources are scarce, though his diary exists and provides some details into his day-to-day life during the war. The man considered by many as the most accomplished engineer in the Confederacy is today only remembered by a bust at Vicksburg National Military Park and a small case containing his uniform in the Museum of the Confederacy—a legacy lost to history. This entry was posted in Campaigns, Leadership--Confederate, Memory, Personalities and tagged Confederate Engineer Corps, David Farragut, Hanover Junction, James Longstreet, John Bell Hood, John Pemberton, Longstreet's Flank Attack, Martin Luther Smith, Mobile, Mobile Bay, Mule Shoe, North Anna River, Overland Campaign, Robert E. Lee, Spotsylvania, Tennessee Campaign, Vickburg, wilderness. Bookmark the permalink.